Jonathan Parham as Paul Trevigne sings about striking down constitutional amendments that discriminate against Black men and women’s rights. “Les Lions de la Reconstruction,” 2018. Photo Credit: Cedric Ellsworth. Aria Mason has been shaping New Orleans opera since she was in utero, pushing against the diaphragm of her mother, mezzo-soprano Givonna Joseph. Some pregnant singers experience shortness of breath or sluggish vocal chords. But Joseph’s vocal tones improved so markedly during pregnancy that her friends urged her to give the baby an operatic name as a tribute. After her birth 35 years ago, she was christened Aria. Givonna Joseph (left) and Aria Mason (right), the mother-daughter opera singers/producers who founded OperaCréole. The performance company is devoted to reviving the lost works of composers of African descent who shaped New Orleans’ 19th century opera culture. Photo Credit: Gus Bennett. Mason grew up to be a stunningly beautiful mezzo-soprano who never fails to keep up her end of the conversation and is somehow able to produce and design opera performances while starring in them. Her family has spent seven generations in New Orleans. It’s also the city of her art, where she and her mother founded the company OperaCréole to revive the lost works of composers of African descent who were part of a thriving New Orleans opera culture in the 1800s. Mason is the living embodiment of an opera heroine—in one too many ways. Between this summer and fall, in the midst of her engagement to research scientist Henri Folse, she spent four weeks in the hospital, fighting a heart infection and enduring three separate surgeries related to several rare, degenerative conditions. For much of her hospital stay, treatment rendered her nearly immobile, as doctors hooked her up to a heart monitor and four intravenous lines—two in her arm and one in each foot. But she couldn’t be idle: their production of “Les Lions de la Reconstruction: From Black Codes to the Ballot Box” was slated for October at the Marigny Opera House in New Orleans. Joseph, with Folse’s help, toted bags of props to the hospital, penned the opera’s entire libretto in English, French, and Louisiana Créole, composed some of its music, and played a lead role in the production. Floor nurses also became part of the production, rotating Styrofoam wig heads whenever they took Mason’s vitals—they’d move completed hairpieces to her room’s window sill, replacing them with others that still needed stitching. Mason even enlisted visitors to arrange containers of beads, jewels and metals on her metal hospital tray so that she could talk while making the show’s costume jewelry. On other days, nurses propped her pillows into place at angles that allowed her hands, IVs and all, to tap away on her laptop, setting the show’s cues, making script changes, researching 19th-century pigments for costumes, and translating French and Louisiana Créole lyrics into English for the show’s supertitles. She assigned each character a color and color-coded everything—script, wardrobe, props, wigs, and cues—in Roy G. Biv order, using the color-coded tabs and labels that she buys in bulk. There, with her head propped on a freshly bleached hospital pillow, Mason shut out the beeping bedside machinery and sketched out sets with the magical colors and lighting that are a signature of OperaCréole productions. The women and men sing in joy and gratitude for the opportunity to vote for constitutional delegates. “Les Lions de la Reconstruction,” 2018. Photo Credit: Cedric Ellsworth. In the public mind, the term “New Orleans music” prompts thoughts of jazz or spirituals. But the city’s deep opera roots date back to 1796, when audiences crowded into Theatre St. Pierre in New Orleans for the first known opera performed in America. Free men of color actively participated in and attended each of the city’s five opera houses in the 1800s. But their prominence faded before the end of the century, as Jim Crow laws barred Blacks from the opera houses. Their work largely sat on dusty shelves until two centuries later, when Joseph and Mason formed OperaCréole, thought to be the nation’s only opera company run by a mother-daughter team. “New Orleans has always been a multicultural, musical city, but we rarely talk about the classical and operatic composers, the free men of color who were in the opera houses, studying in Paris, composing and publishing music in the mid-1800s,” Joseph said. The company’s October production of “Les Lions” tells the stories of people of color who fought for human rights and equality in New Orleans between 1863 and 1867, during and after the Civil War. For the most part, history has overlooked this groundbreaking fight in New Orleans just as they have overlooked the important work of the 19th-century New Orleans Créole composers featured in the show: Edmond Dédé, Basile Barés, François-Michel Samuel Snaër, and Charles-Lucien Lambert. Edmond Dédé is a good example of those whose work was concealed, said Joseph, who wrote Dédé into the beginning of “Les Lions.” At the top of the show, baritone Terrance Brown, who played the role of Dédé, strode onto stage and sang his heartbreaking goodbye to New Orleans. A highly regarded violinist and published composer, Dédé studied at the Paris Conservatory of Music and stayed in France for 35 years before coming back to his native New Orleans for a visit in 1893. By then, Reconstruction had ended, giving way to a wave of white supremacy that felt particularly acute to Dédé, a dark-skinned man. Barred from performing in the city’s opera houses, Dédé gave concerts in Black churches, where the acoustics were often lacking. After a year, weary of the prejudices he faced, he sang his farewell ode to New Orleans and sailed off to spend the rest of his life in France. After revealing the struggles ahead, the storyline of “Les Lions” drops back 30 years, to more hopeful times. In 19th-century New Orleans, the music and the history intertwined, in ways that had national significance. During that time, composers like Dédé, Snaër, Barés, and Lambert gained some public recognition. That made them, by definition, civil rights figures. Because, to be recognized as artists in their own right, they had to first be acknowledged as men. All four composers were part of the city’s large population of gens du couleur libre, free people of color, who made up one-third of the city’s population in 1810, a proportion far higher than anywhere else in the South. That community boldly demanded that voting rights be awarded to all Black men. “Les Lions” tells the story of their struggle for suffrage through the eyes of the composers and other prominent members of that community: the journalists who launched L’Union, the South’s first Black-run newspaper in 1862; the city’s only abolitionist priest and his friendship with Captain Andre Cailloux, a free man of color from New Orleans who became a Union Army hero after he died in battle in 1863. Among the activists was Henriette Delille, a free woman of color who founded an order of Black nuns, Sisters of the Holy Family. Using a loophole that allowed religious education of slaves, the sisters instructed slave children in the catechism, despite a Louisiana state law barring anyone from teaching slaves to read and write. In the finale of “Les Lions,” people of color cast votes for delegates who will go to the Louisiana state constitutional convention. 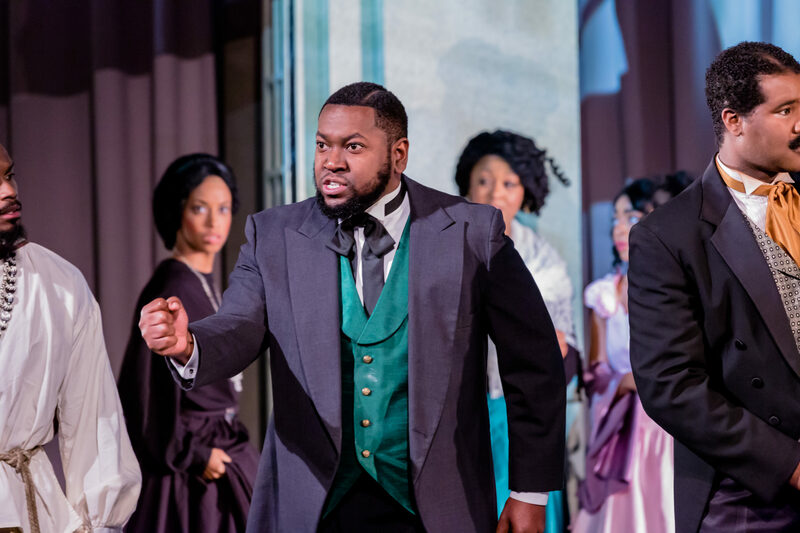 The music soars, only to hit a sour note when Barés is ejected from the French Opera House, signaling a deterioration of civil rights that marked the end of Reconstruction in 1877. White supremacists put more restrictions on Black New Orleanians in coming years. By 1892, shoemaker and civil rights lion Homer Plessy felt that it was time to take a stand at the Press Street railroad depot, mere blocks from the Marigny Opera House where OperaCréole often performs. With hopes that his arrest would help overturn Louisiana’s recently passed Separate Car Act, Plessy, a light-skinned Afro-Créole activist, gave notice to the railroad that he was walking onto a whites-only train car. Instead, in 1896, the U.S. Supreme Court decision Plessy v. Ferguson ushered in nearly 60 years of codified segregation across the South. More than a century later, a train whistle blew from the nearby tracks as the voices of OperaCréole carried the classical compositions of Black composers and the true story of “Les Lions” back into the humid air of the city. “It’s opera as restorative justice,” Mason said. After a Lenten concert this spring in the historic St. Mary’s Catholic Church in the French Quarter, a group of wiggly middle-schoolers rushed to the front to speak with Mason. She maintained periodic eye contact with them all through the recital, clearly explaining the history of opera in the city. She even invited them to snap their fingers along with “Dem Bones,” a traditional spiritual sung by a tenor. Mason, who formerly worked as a second-grade school teacher, easily moved into classroom-explanation mode. Because of her conditions, she is even more aware of how sound moves through the body, because she must push her breath in new ways to create sound, despite scarred lungs and failing muscles. She invited the boy to put his hand on her abdomen and showed him how she breathed and created vibrato tones. Joseph, who is also a trained music therapist, is part of this ministry, bringing OperaCréole into schools, where she teaches school kids how to tell stories about everyday topics that interest them. Together, they write mini-operas about explorers and fidget-spinners. Because of her conditions, she is even more aware of how sound moves through the body, because she must push her breath in new ways to create sound, despite scarred lungs and failing muscles. She invited the boy to put his hand on her abdomen and showed him how she breathed and created vibrato tones. As a child, Aria learned stories through the lens of family members, who resisted fairy tales and historical falsehoods. “My mother told me that Cinderella bought a condo and started her own business,” Mason remembers. When she came home with her Thanksgiving-costume assignment, her great-grandmother told her, “You’re no Pilgrim,” explained the shared history of Native American and Black Créole peoples in New Orleans, and sent her to school dressed as a Choctaw, in protest. From her paternal grandparents, who lived in Mississippi, she got an inside look at one of the hot spots of the nation’s civil rights movement. Her grandpa and grandma, Dr. Gilbert and Natalie Hamlar Mason, successfully petitioned for expanded healthcare for Black patients and pushed for an exhaustive list of reforms, including the right of Black students to attend all public schools in Biloxi, Mississippi. Starting in 1959, in one of the earliest civil-disobedience campaigns in the state, they also led “wade-ins” that resulted in the integration of a 26-mile-long beach in Harrison County. For Joseph, it’s no surprise that her daughter followed her footsteps into opera. She credits Aria with improving her singing voice during pregnancy. When Joseph weathered a serious car accident during the second trimester, she felt her daughter still moving, still with her, and knew she was okay. “We always just seemed to be connected,” she said. Kayla Lewis as Mademoiselle Georges sings an aria from "La Sonnambula," a favorite of the New Orleans’ French Opera House in the 1800s. “Les Lions de la Reconstruction,” 2018. Photo Credit: Cedric Ellsworth. Because of her hospitalization, Mason relinquished her singing role as a nun in “Les Lions.” Instead, clad in a black t-shirt that read, “Creole Girl Magic” and a matching black crinoline skirt, she introduced the show and ran its technical aspects from the production director’s desk at the edge of the theater. Performing on-stage was not an option. “I’m not able to rely on my body like I used to,” she said. Still, Mason was in charge, as she typically is. Before each show, she walked to the front, scanned the audience, and made a few remarks. On one night, she introduced some nuns from the Sisters of the Holy Family—“I hope me and my mom, two good Catholic girls, do right by you”—and asked a few descendants of the opera’s characters to stand. She also wasn’t able to resist the stage completely. During the first scene of the first act, Folse quietly walked to the stage-manager’s desk backstage to sub for Aria while she jetted off behind her rolling red medical walker. During the very next number, a mysterious off-stage mezzo-soprano voice harmonized with the soloist. Mason sees her fight for healthcare as part of the larger struggle faced by thousands across the nation, one that echoes the work of her grandfather. She’s active with an online support group and has learned to fight for what she needs, she said. Earlier this year, after two years of battles with multiple layers of healthcare bureaucracy, she began receiving IV treatments that helped tremendously in keeping her out of the hospital. But to date, she and her mother have talked about her illness mostly in optimistic terms. “We’ll cross that bridge when we come to it,” said Joseph, who has seen her daughter go in one day’s time from feeling fine to running a 103-degree fever and fighting a heart infection. Sometimes, when the chorus is gone, and the wigs and the spiral-bound musical scores are all packed away, Mason does wonder about the future of what she and her mother have built. “What happens after I’m gone?” she asked. Keturah Heard as Zizi and Micah Turner as Babba sing in Congo Square about claiming their freedom in a new era. “Les Lions de la Reconstruction,” 2018. Photo Credit: Cedric Ellsworth. “I don’t like to talk about it too much,” Joseph said. “At all,” said Mason, raising an eyebrow. Joseph, unbothered, said that she simply didn’t want to attract bad luck by discussing anything that could take a turn for the worse. “I don’t want to call out to the universe,” she said.